Midway Island to Honolulu, attractive green/cream Crosby cover with inset photo of 'China Clipper', posted on arrival, Honolulu Dec 7, 1936, black 'Penguin' Midway cachet. 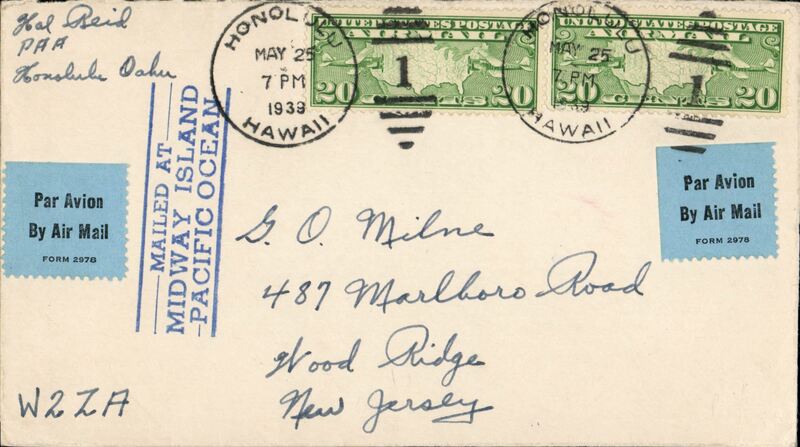 Midway Island to New Jersey, USA, no arrival ds, plain cover franked 20c air x2, canc Honolulu May 25, 1939, tying blue black airmail etiquette, large blue circular "Mailed at Midway Island" Gooney Bird cachet verso, blue three line "Mailed at/ Midway Island/Pacific Ocean" on front. Although Pan Am set up a base for its clipper service in 1935 there was no post office on Midway until the outbreak of WWII. Before then all mail was channelled through Honolulu or Guam. A scarce item in fine condition. 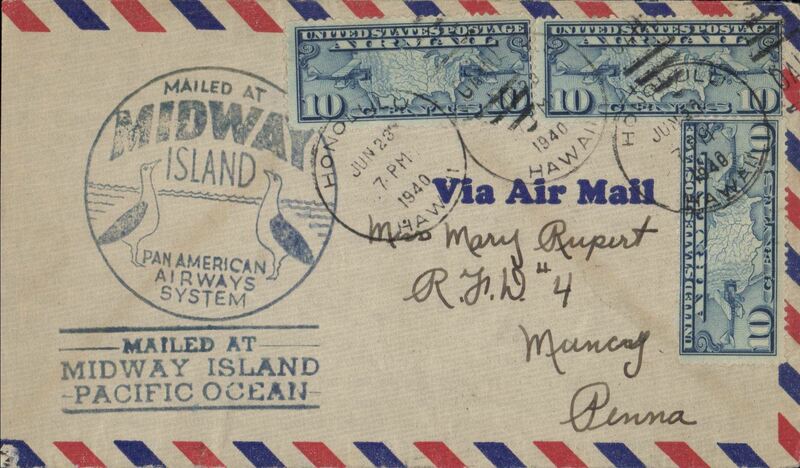 Airmail cover mailed from Midway Island and posted on arrival at Honolulu Jun 23, 1940, franked 30c air, fine strikes of blue circular 'Mailed at Midway Island' with Gooney Bird, and the scarcer blue three lined 'Mailed At/Midway Island/Pacific Ocean' cachets. Neat non invasive 7mm left hand side trim. Sent from the Navy Construction Camp and signed verso by nine contractors. Tensions between the Japanese and Americans were high and, with Midway deemed second only to Pearl Harbor, Oahu in importance for protection of the West Coast, the Navy, in March 1940, working with private industry, formed a coalition of contractors known as Contractors Pacific Naval Air Bases to start construction of the runways on Eastern and other infrastructure on Sand Island in preparation for possible hostilities. 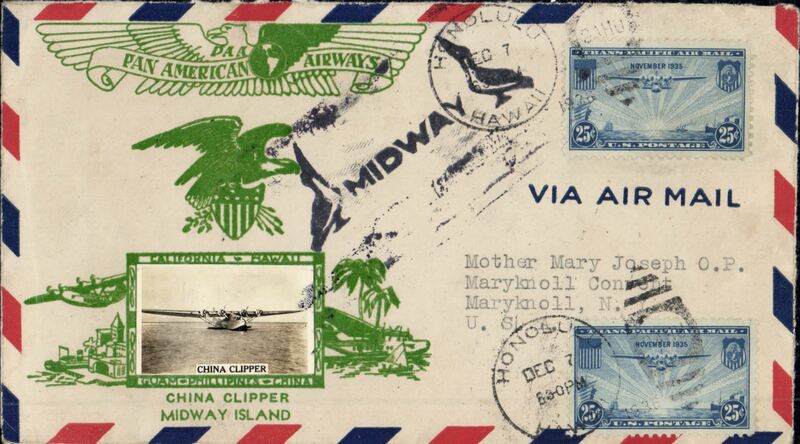 Midway Island, legal size air mail cover carried on the Pan Am Clipper, franked 30c, canc Midway Det 3rd Def. Bat. Fleet with Midway Island bar cancel Feb4, 1941, blue forerunner cachets front and verso reading "Mailed At Midway Island / Pan American Airways System" with illustration of Gooney birds, addressed to Hollywod, CA.